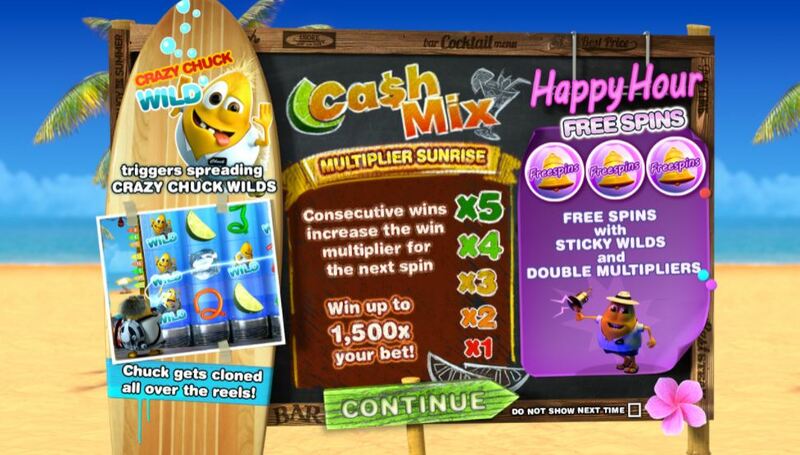 Cash Mix is a Sunfox Games slot, available at this online slot casino with a 5x3 layout and 15 fixed paylines. Play this online slot and stand to win from a variety of bonus features including multipliers, expanding wilds and free spins. This is a fun tropical theme so if you’re in the mood for some sun, time by the beach (while cashing in some coins), then go ahead and give this Sunfox Games slot a spin. Sunfox Games was established in early 2011. The company is comprised of young bright staff with most of their employees having a strong love for mathematics, graphics and gambling. The company has its headquarters in picturesque Vienna, Austria. The city is said to always be buzzing with excitement and so are Sunfox Games. They've released less than 5 games despite operating for years. These include Cash Mix & Gemburst. Cash Mix incorporates classic slot symbolism, but presented in a modern and funny way. The action here is set in a tropical beach bar. Tanks of water serve as the slot's reels. Quite interesting to note is that symbols in Cash Mix don’t spin, but flow through water while a relaxing beach soundtrack booms in the background. The main characters of the slot look just like our favourite goofy, yellow friends the Minions. They sit right next to the reels cooking up juicy cocktails before jumping over the bar once a bonus feature hits. Symbols on the reels include the usual playing card values, a cocktail umbrella, olive and an ice cube. These 3 symbols pay between 20-30x your bet when 3 matching symbols hit. You win 125x-200x your bet when 5 hit. The slice of lime and strawberry pay middle payouts of 12-100x your bet, depending on a particular symbol and its numbers. Multiplier Sunrise feature -It is triggered by any twinning combination formed. It adds a 1x multiplier to all back to back wins which are collected when spinners reach the highest multiplier value of 5x. If you alter your bet or lose on a spin when the feature is already active, the multiplier resets back to 1x. It's easy to win from this feature thanks to Crazy Chuck. He's a wild that you’ll see traveling down the water tank every now and then. He gets stuck inside and the "doctor" jumps out and starts shooting Crazy Chuck with an electric ray gun. The doctor “accidentally” misses him several times and in the process clones the wild on the reels. The feature eventually ends, but it leaves behind multiple wild symbols that can lead to better and bigger wins. Happy Hour free spins -These can be activated when 3 or more free spins symbols hit the reels. During the free games, any new free spins symbols that hit the reels transform into sticky wilds and double the Sunrise Multiplier for any new wins. If you activate the round with 3 symbols, you'll win between 4 and 7 free spins with 3 sticky wilds. Activate the round with 4 or 5 symbols and you’ll win between 7 to 10 with 4 sticky wilds or 10 to 15 free spins with 5 sticky wilds. This Cash Mix online slot offers great relaxing vibes and exciting bonuses that are simple yet highly rewarding. It's a great choice if you love eye beachy tropical theme. Its fair 96.37% RTP ensures low-betting limits and a low-medium volatility. If you enjoyed Cash Mix, why not try Blackjack?